Derry City will take on league leaders Dundalk at the Brandywell in the EA Sports Cup quarter-finals. The game will be played on 26/27 May with former Candystripes boss Stephen Kenny now in charge of Dundalk. City progressed to the last-eight stage thanks to a Rory Patterson goal in Monday's 1-0 win at Sligo Rovers. In the other quarter-finals Wexford Youths welcome Galway, Bohemians travel to Longford and Shamrock Rovers are home against Cork City. 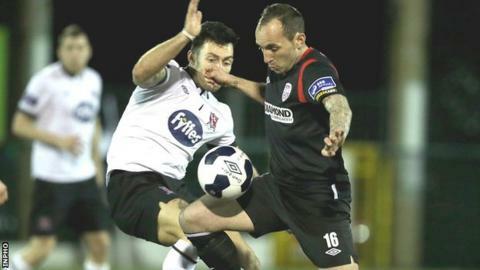 Dundalk secured a comfortable 3-0 victory over Derry at Oriel Park when the two sides met in a Premier Division encounter last month. Brian Gartland, Richard Towell and David McMillan bagged second-half goals for the Lilywhites.